Ethiopia is one of the earliest nations to adopt Christianity, in the early half of the fourth century, with its historic roots dating to the time of the Apostles. The Lalibela Churches in Ethiopia conjures up a mythical appeal. Many churches and monasteries are perched on mountain sides overlooking steep gorges. And indeed, nowhere else on the planet is there larger monolithic churches, like The Lalibela Churches. The Lalibela Churches, were built by King Lalibela in the 13th century, as an African alternative to the Holy City of Jerusalem. King Lalibela, revered as a saint, is said to have seen Jerusalem, and then attempted to build a New Jerusalem as his capital, in Ethiopia. At the time, Christian pilgrimages to Jerusalem were halted by Muslim conquests. Fortunately, the Holy City of Lalibela became a substitute for the holy places of Jerusalem and Bethlehem, and as such, had a considerable influence on Ethiopia’s Christianity. Contrary to modern belief, Lalibela’s eleven churches were not built from a brick, but rather carved from living rock, sometimes residing underground. The blocks of rock were intricately hewn with doors, windows and drainage systems, all carved from the original stone structure. King Lalibela’s motivation for this method of construction, and the exact techniques of carving, are not entirely clear, it is said to have taken 24 years to complete the impressive designs. Legend has it that while the king worked with local Ethiopian artisans and architects by day, angels took over and helped them complete the task by night. “Food Is Our Common Ground a Universal Experience,” and enjoy your meal!" Whole Foods For Whole Health! Lalibela Provides customers, a healthy delicious ethnic Ethiopian Cuisine. It is a premier themed ethnic restaurant at the Rose District area of Broken Arrow, in OK, at 312 S Elm Street. The Ethiopian traditional food menu incorporates Beef, Lamb, Chicken, and Fish. And the vegetarian dishes come with a variety of flavors and delicacy. Including mild sauces made from legumes, cabbage, and a variety of other greens. Ethiopian cuisines have a unique and delicious flavors because of the slow cooking styles, seasoned with clarified butter, virgin olive oil, homegrown sun-dried chili peppers combined with ginger, garlic, basil, and a variety of aromatic spices. The menu at Lalibela Ethiopian Restaurant include mostly beef, lamb, and chicken dishes. Spice lovers will likely be very happy, as all kinds of spices are used in the dishes, including hot paprika, cardamom, nutmeg, and ginger. 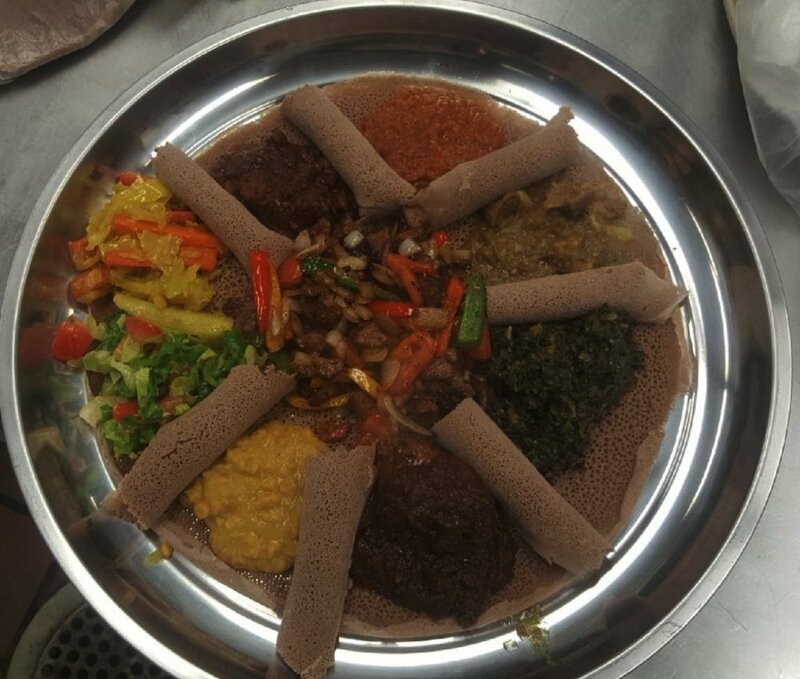 For those unsure of what to try, the Lalibela Combination is a good place to start, as it comes with several items, including beef, chicken, lentils, split peas, and cabbage. There are milder dishes as well, like Tibs ( prepared from tender beef, onion, pepper, and rosemary). If you like your food hot and spicy, the Awaze tibs (marinated beef with spices) is an outstanding choice, with a sweat-inducing mix of paprika, hot chilis, ginger, and garlic). The vegetarian options are made from peas, cabbage, potatoes, carrots, green beans, lentils, and salads. As is the case with Ethiopian food, using silverware is optional; instead, a spongy flat bread called Injera is included with each dish, which allows diners to create a sort of sandwich or scoop to eat the food, chicken or beef stews. Atikilt Alicha, & Ye Misir Wat. Pastry shells filled with spiced vegetables or lentils. Pastry shells filled with spiced chopped beef. Sweet pastry made of layers of filo filled with chopped nuts and honey syrup. Classic handmade, trans fat free. Split lentils, in red pepper sauce, seasoned with assorted spices. Served with injera. Steamed peas sautéed with onion and assorted spices. Served with injera. Sautéed vegetables, with onions and assorted spices. Served with injera. Kale Greens sautéed with onions, garlic, assorted spices and green chilies. Served with injera. Ethiopian signature ground peas, slow cooked with garlic, onions, and red ground pepper. A combination of Yeater Alicha, Atikilt Alicha, Misir Wat, and Greens with salad. Served with Injera. *DISCLOSURES: CONSUMING RAW OR UNDER COOKED MEAT, POULTRY, SEAFOOD, SHELLFISH, OR EGGS MAY INCREASE YOUR RISK FOR FOOD BORN ILLNESS. THE FDA ADVISES AGAINST OFFERING RAW OR UNDER COOKED MEAT, POULTRY, SEAFOOD, OR EGGS TO CHILDREN. Tender chicken stew, slow cooked in special red ground pepper sauce, served with hardboiled eggs, ,and salad. Served with Injera. Beef stew, with meat strips, cooked with seasoned red ground pepper sauce and spices. Served with injera. Mild lamb stew added garlic and other assorted spices. Served with injera. *Finely chopped lean beef seasoned with spiced butter, served with spiced collard greens, homemade cottage cheese, and mitmita or spicy ground hot chilies. Served with injera [ *traditional Ethiopian Kitfo is served raw, medium to well done. Service based on personal choices]. Tender beef cubes cooked with onion, tomato, green chilies and colored sweet peppers and spicy butter with side salad. Served with injera. Tender beef cubes sautéed in Awaze sauce, a flavorful blend of Berbere spices, smoked paprika, lemon juice and wine. Served with Injera. Spaghetti with tomato sauce served with fried fish and salad. Salad of cooked lentils, fresh onions, jalapeno peppers, garlic, and spices with olive oil and lemon dressing. Tomatoes, jalapeno peppers and onions tossed with lemon and olive oil dressing. If you have a customer service question, a professional inquiry, or just want to talk to us about how much you've enjoyed our awaze tibs, feel free to leave us a note at Lalibelarestaurant.Ok@outlook.com.